I am sure you are using one of the cloud base photo sharing services for your taken pictures. You may use Yahoo Flickr or Google Picasa based on your needs and features that are offered by these services. Mind you, there are many more services like this available on the Internet. I prefer Google Picasa personally as I am true Google’s user and taking advantage of all available services offered by Google for my personal or business needs. There maybe situation or times when you decide to switch your favorite photo storage provider and you will need to transfer/move your content between them. I have found very nice and FREE tool to help you out to move your pictures from one service to another. 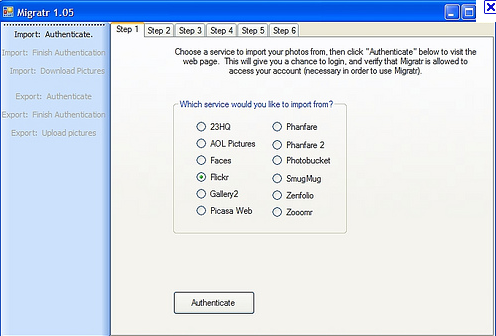 The tool is called Migratr and it is a small Windows only utility that allows you to bulk copy of your pictures from one sharing service such as Flickr to Picasa or others. It has very simple graphic user interface with wizard. Simply just follow up the steps and your task will be completed to your satisfaction.